Asbestos is a naturally-occurring, fibrous silicate mineral that is highly resistant to heat, electricity and chemical corrosion and can be woven into fabrics. Pure asbestos acts effectively as an insulator, and it can also be mixed into cloth, paper, cement, plastic and other materials to give them strength. It is used in brake linings and in fire-resistant and insulating materials and only a few decades ago was a regular option for insulation, building and construction in Melbourne. Why Do I Need To Remove Asbestos? Over time, the health effects of asbestos have reared and it is now publicly known as a highly toxic substance that is no longer in commercial use in Melbourne. What makes asbestos dangerous to people is its natural qualities. Asbestos fibers are so small, they cannot be seen, smelled or tasted and because asbestos exposure doesn’t cause any immediate symptoms, it is very easy for a person to inhale or swallow asbestos dust without realizing it. Once asbestos fibers are in the body, because they are so microscopic, they never dissolve, and the body has extreme difficulty expelling them. Over years, trapped asbestos fibers can cause inflammation, scarring and eventually genetic damage to the body’s cells. A number of diseases and conditions of the lung, including cancers have been attributed to damage by asbestos. Even though it’s no longer in use, many buildings in Melbourne still contain asbestos, so if you have noticed the signs or are under any suspicion at all, be sure to contact professionals for a consultation so they can inspect and identify the problem. Some jobs require urgency due to health and safety concerns and sometimes due to individual preferences and circumstances. Asbestos Removals Melbourne, in order to accommodate to getting your asbestos removal service done at your convenience we operate 24 hours a day, 7 days a week. It is best to hire a professional to identify asbestos in your home or business because not only are they trained to know exactly what they’re looking at, they also have the materials and a sound knowledge of protective measures to ensure safety. Our team of asbestos removal technicians at Asbestos Removals Melbourne will always start off with a free of charge, on-site consultation, so that we can understand your needs, get an idea of the problem and make sure you too, understand the process to be undertaken. We are not faceless contractors who will rush to finish a job without any question; we are asbestos removalists who understand every situation is different and focus on the individual needs of every unique client. It took a while for the use of asbestos to be phased even while health research studies were released. So, many homes in Melbourne, particularly if they were built in or before the 1980s, most likely contain asbestos. 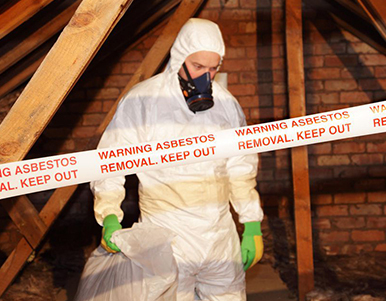 After a personal consultation, we will get into every necessary nook and cranny to fully rid your home of asbestos so you can ensure the health and safety of your family. We operate carefully in accordance to regulations and pay close attention to detail to keep your home in good shape throughout the process. We offer a full range of residential removal services so you don’t have the extra hassle of contacting multiple parties for different jobs. Asbestos was largely profitable to business as it was not scarce or expensive and a very effective insulator. Commercial use was very popular and many industrial or commercial Melbourne buildings built during or before the 1980s, will contain asbestos. Our specialist team at Asbestos Removal Melbourne, is experienced in industrial asbestos removal and we always operate with care and efficiency to ensure all asbestos items are completely removed from your industrial properties and structures. We understand the costs and concerns of stopping business for these kinds of large scale maintenance procedures. That’s why we always start with an in-depth consultation and analysis to learn about your needs and determine the best course of action to take so we can minimise any excess disturbances to your workplace. We will operate as best as we can, within limitations of the amount of work needed, to complete your asbestos removal service in a timely manner. With Asbestos Removal Melbourne, you don’t need to worry about remnants of asbestos being left behind. Our team pay close attention when it comes to waste removal, we thoroughly collect all waste materials for pick-up and ethically dispose of asbestos in EPA registered landfills.